Hard boil eggs, cool, peel, and slice lengthwise into halves. Scoop out yolks into a bowl. Place egg white halves on serving plate. While eggs are cooking, drain kimchi and save the “juice” in a separate bowl. Very finely chop kimchi. Using a fork, mash cooked egg yolks with mayonnaise; the mixture might seem a little dry which is okay. Add chopped kimchi and stir well. Add a little bit of the kimchi “juice” at a time until the yolk mixture is a creamy consistency. If the mixture still appears dry, add a little more mayonnaise. Spoon about a tablespoon of the kimchi egg yolk mixture into each egg white half. 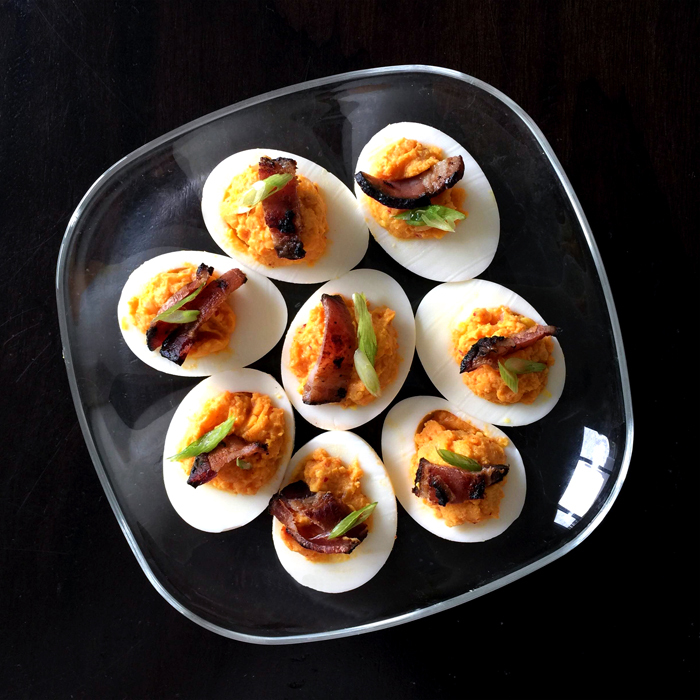 Garnish each deviled egg with a piece of crispy fried bacon and optional garnishes. I like sliced scallions. I hard boil eggs by lowering eggs into boiling water with a ladle, bringing the water back up to boil, then lowering heat to a gentle boil and cooking for whatever time. For deviled eggs, I cook the second time for 10 minutes.